One of my pet peeves in sports broadcasting is the recent trend of TV sports anchors doing a themed sportscast in an attempt to boost their careers by going viral on the Internet. Yes, a sportscast featuring 30 references from a famous movie is clever and entertaining, but it’s also a cheap publicity grab. Truly great sportscasters are clever and entertaining every time they turn on the mike. This now brings me to Dan Cohen. In the name of full disclosure, Dan is an STAA member but I would be writing this post even if he weren’t. 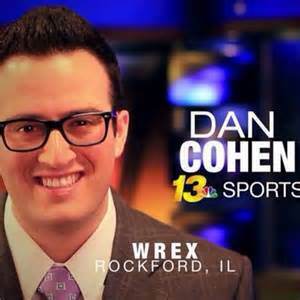 Dan is a sportscaster at WREX in Rockford, IL. Recently, students at a high school basketball game had “Dress Up as Dan Cohen Night.” Dan wears thick-rimmed glasses and has a cool, unique fashion sense (I’m envious!). More notable is the fact that Dan’s audience loves him. That is why they honored Dan by being him for 90 minutes one night. Read about it, and better yet, see the pictures here. Great sportscasters don’t need to beg for attention. Great ones, like Dan Cohen, earn attention by being themselves and being consistently good, night in and night out.